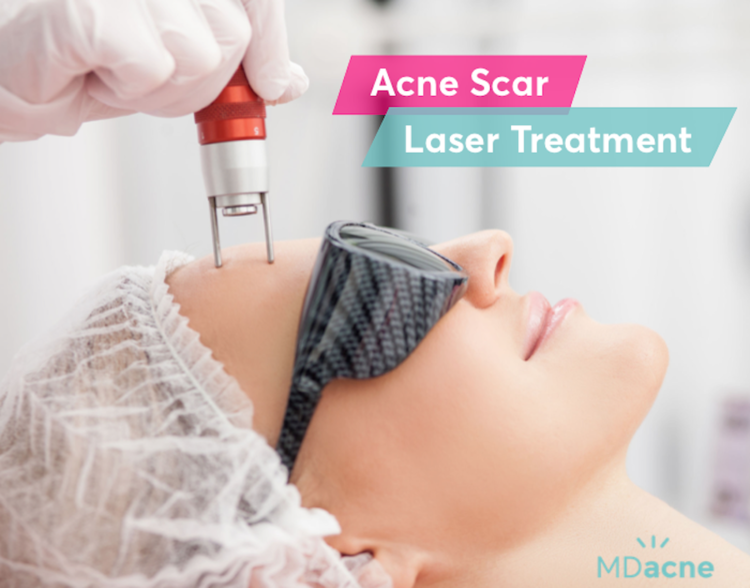 Laser scar treatment (also referred to as laser resurfacing or laser therapy) is one of the most effective ways to treat acne scars and improve the overall appearance of the skin. While topical skin care products can help control acne and fade post-inflammatory hyperpigmentation (check out the MDacne Dark Spot Remover for that), true acne scar reduction typically requires more intensive treatment. If you currently struggle with both active acne and acne scars, it is important to first get the active acne under control with an effective, acne treatment before beginning any additional cosmetic treatments. To find the right acne skin care routine for your skin, take the free MDacne skin analysis. What are the different types of acne scar lasers? Ablative Laser Resurfacing: The process of removing the damaged, outer layers of skin. In the past, lasers were used to resurface (i.e. burn) large areas of skin at the time—frequently the entire face. Full face laser resurfacing required several weeks of downtime and produced significant side effects (changes in skin color, laser-induced scars, etc.). However, in the last decade, most dermatologists have started using a safer way of laser resurfacing, called fractional laser treatment. Ablative: Examples of ablative lasers are CO2 lasers and Erbium YAG lasers. CO2 lasers are more potent and penetrate deeper into the skin. However, they're also more painful and require more extended downtime. The ablative laser using erbium technology has fewer side effects but also inferior results. Non-Ablative: These lasers use a narrow beam of infrared light (1550 or 1450 nanometer), are milder, and do not cause burns. For visible results, non-ablative lasers require 3-5 treatments. Non-ablative fractional lasers send their energy through the skin's surface, without disrupting the outer layers of the skin. The advantage of the non-ablative fractional lasers is that it only requires 2-3 days of downtime, though most patients need at least five treatments with these lasers to equal the efficacy of one fractional CO2 laser resurfacing treatment. What is the process of acne scar laser treatment? Laser treatments for acne scars are outpatient procedures performed by board-certified dermatologists and laser therapy experts. These procedures require topical anesthetic (sometimes even sedation) to numb the skin. The fractional resurfacing laser is moved over the targeted area of the skin, destroying damaged skin cells and promoting the growth of newer, healthier cells. Each treatment session typically lasts between 20 and 30 minutes. What kind of acne scars does laser treatment help with? Fractional lasers can help with depressed atrophic scars (AKA rolling scars or boxcar scars). They will usually not help with ice pick scars, hypertrophic scars of keloids. Pulsed dye lasers (PDLs) are a different kind of laser that can be used to flatten and reduce the volume of hypertrophic scars for improved skin texture and pliability as well as decreased redness with minimal damage to other epidermal or dermal structures. Hypertrophic facial scars may require several treatments for optimal results. Can lasers help with hyperpigmentation? While hyperpigmentation is not technically a "scar," it does also respond well to laser treatments. That being said, hyperpigmentation can usually be treated effectively without a laser procedure. A much lower cost and less invasive alternative would be a dark spot treatment, such as the MDacne Medicated Dark Spot Remover or prescription Kligman Formula from a dermatologist. Another way to treat hyperpigmentation is with a series of non-invasive chemical peels performed by a dermatologist or licensed esthetician. Do laser acne scar treatments work on dark skin? For individuals with darker skin fractional laser treatments (particularly CO@ abdo come with a higher risk of cell damage or discoloration. Tlathat said, for lighter-toned African American, Hispanic or Asian skin tones, the milder Erbium lasers can sometimes be a good option, posing less risk for su discoloration. Patients with darker brown or black skin may need to consider other treatment options for acne scarring such as microneedle radio-frequency treatments which are safe for all skin types. Visible results with fractional laser treatments usually require at least three treatment with a resurfacing laser and five treatment with a non-ablative fractional laser. The price of each laser acne scar removal treatment ranges greatly depending on the type of laser treatment, special offers, treatment plan (i.e., number of recommended sessions), etc. Laser treatments should always/only be done by a certified dermatologist in a medical office, which is one of the reasons why they can get a bit pricey. The cost of laser treatment for scars varies. It can range from $300 to $2,000 per treatment depending on the size of the scar and the extent of the procedure. Are there more effective treatments for acne scars than laser therapy? A new treatment called microneedle radiofrequency is considered by some to be superior to fractional laser in treating acne scars. In this procedure, gold plated, ultra-thin microneedles that are inserted into the skin. When the tip of the needle gets to the targeted depths (up to 3.5 mm), the needle emits radio waves that heat the dermis disrupting the scar tissue and triggering the production of new collagen. When using non-insulated needles, this technique provides a minimally painful yet highly effective procedure with excellent results in treating acne scars. Microneedle radiofrequency treatments penetrate 3.5 mm into the skin, 5X deeper penetration than the best fractional laser. Microneedle RF is very different, then a dermaroller and pen micro needling, neither of which heat the depth of the skin. 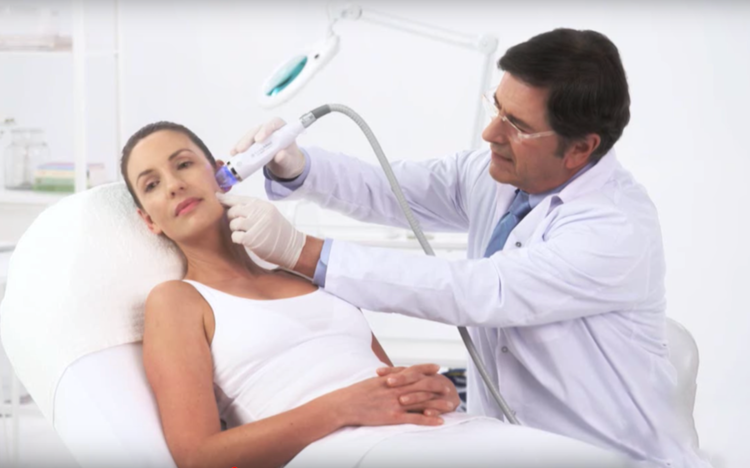 Compared to the CO2 and erbium fractional laser that create small “burn” on the surface of the skin, the Microneedle RF technology does not burn the surface of the skin – so there is little to no downtime at all. What is acne scar surgery? Another more invasive option for the treatment of acne scars is acne surgery or subcision. With this technique performed by a dermatologic surgeon, a scalpel is used to undermine and release the scar tissue under the skin. Acne surgery would be the best option for single deep scars and pitted scars. This procedure will typically be more costly and invasive than Microneedle RF or laser treatment.